[Opinion] Signing statements, restricting freedoms, etc. The following is the final installment in a series enumerating the impeachable offenses of George W. Bush. That is, until another major impeachable offense becomes known. George W. Bush has attached signing statements to more than 100 bills before signing them, within which he has made over 1,100 challenges to provisions of laws passed by Congress. This figure exceeds the total number of such challenges by all previous presidents combined, and Bush has used this practice to exempt himself, as President of the United States, from enforcing or from being held accountable to provisions of the said laws. By declining to veto bills, and instead attaching signing statements challenging laws passed by Congress, he has violated Article 1, Section 7 and Article II, Section 3 of the U.S. Constitution. These articles of the Constitution dictate that the president has the option of signing or vetoing a bill, and upon signing the bill to "take care that the laws be faithfully executed." 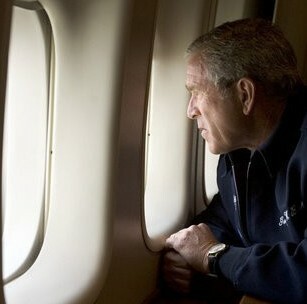 Days after the disaster, Bush looks on. Dec. 25, 2006: Bush writes a signing statement asserting the Executive's right to open mail without a warrant, despite the constitutional requirement to do so. "The executive branch shall construe [the Law], which provides for opening of an item of a class of mail otherwise sealed against inspection, in a manner consistent, to the maximum extent permissible, with the need to conduct searches in exigent circumstances, such as to protect human life and safety against hazardous materials, and the need for physical searches specifically authorized by law for foreign intelligence collection." They also voted unanimously to "oppose, as contrary to the rule of law and our constitutional system of separation of powers, a President's issuance of signing statements to claim the authority or state the intention to disregard or decline to enforce all or part of a law he has signed, or to interpret such a law in a manner inconsistent with the clear intent of Congress;"
"Urge the President, if he believes that any provision of a bill pending before Congress would be unconstitutional if enacted, to communicate such concerns to Congress prior to passage;"
George W. Bush ordered the freezing of financial accounts without limit to how groups were chosen to be on such a list, and also ordered himself the power to create blacklists of any individual Bush felt was associated with the aforementioned groups, thereby creating a system of "guilt by association." Federal judge in Los Angeles rules that provisions of an anti-terrorism order issued by President George W. Bush after Sept. 11 are unconstitutional. U.S. Federal District Court Judge Michael Mukasey rules that the order to detain U.S. citizen Jose Padilla was illegal, and denied Padilla his constitutionally protected right to a lawyer. The court rules that: "(i) Padilla does have the right to present facts; (ii) the most convenient way for him to go about that, and the way most useful to the court, is to present them through counsel; and (iii) the government's arguments are insufficient to warrant denying him access to counsel." (Detention Judicial Opinion). Thank you for reading this impeachment series, which represents evidence in the public domain. Given the secrecy of this administration, it seems highly likely that many more impeachable offenses would be uncovered if the U.S. House of Representatives used its subpoena power in an impeachment investigation. The members of the House of Representatives have ignored their oaths of office to "support and defend the Constitution of the United States against all enemies, foreign and domestic" by failing to initiate this procedure. Some of you may be wondering why I have left out certain charges against Bush you feel warrant impeachment. Some of those charges might include his performance before and after Katrina and 9/11, his policies toward the African AIDS epidemic, his response to border patrol issues, U.S. attorney firings, environmental abuses, politicization of federal agencies, and certainly others. Were we in a more perfect world, we would have enough political will and public support to impeach Bush, or any other president, over these types of offenses. However, my purpose in writing this series was to clearly enumerate the impeachable offenses that were the most likely to have broad agreement in light of the evidence available. Some of the offenses not included I felt were politically polarizing, do not titillate the American public, or are not well enough understood by them. Because the world is in such peril under this presidency, I feel it is important to choose effectiveness over righteousness. Many who comment on impeachment will throw in every potential offense and thereby minimize and marginalize the individuals involved in the impeachment movement. If the movement is to be successful, it must draw from every color in the political spectrum. While I’ve limited my charges to this five-part series, it seems unlikely that part five will be the last in this series. Will part six involve a preemptive war on Iran or further developments in the U.S. attorney firing scandal? Or, perhaps, part six will be some new unpredictable abuse of power. While we can’t predict what the next part will be, that there will be one is almost certain. Since all of the information in this series is available to the public, and we all know what Bush is capable of doing, it becomes the responsibility of U.S. citizens to demand impeachment. Also, Bush and Condoleezza Rice have stated publically that they will remain in Iraq through their tenure in the White House, despite whatever restrictions Congress may try to impose. Given this reality, our failure to act will leave us complicit not only in the continued deaths in Iraq, but in Bush’s next abuse of power, which may include the deaths of countless additional innocents.